State visits are so carefully coordinated that the eventual mishaps often become the most memorable part of the trip. 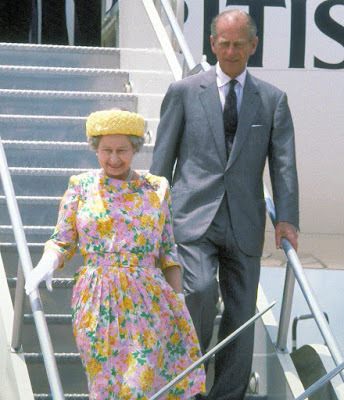 Such was the case when The Queen and The Duke of Edinburgh traveled to the United States to visit President George H.W. Bush in May 1991. What happens when you don't provide for the height difference between Her Majesty and the President? The "Talking Hat" speech is born. It's a good thing she wore that jaunty purple and white striped chapeau for this accidentally hat-centric event, but it's a downright crime that the podium obscured the real treasure of the appearance: the Kent Amethyst Brooch with its three pendants in place. We see the brooch alone often enough - it's even made the favorites list in some years - but the pendants are a special event. The state banquet hosted at the White House featured The Queen's Modern Sapphire Tiara with the George VI Sapphire Demi-Parure, the luscious sapphire necklace and earrings given to her by her father as a wedding gift, and her Modern Sapphire Bracelet. 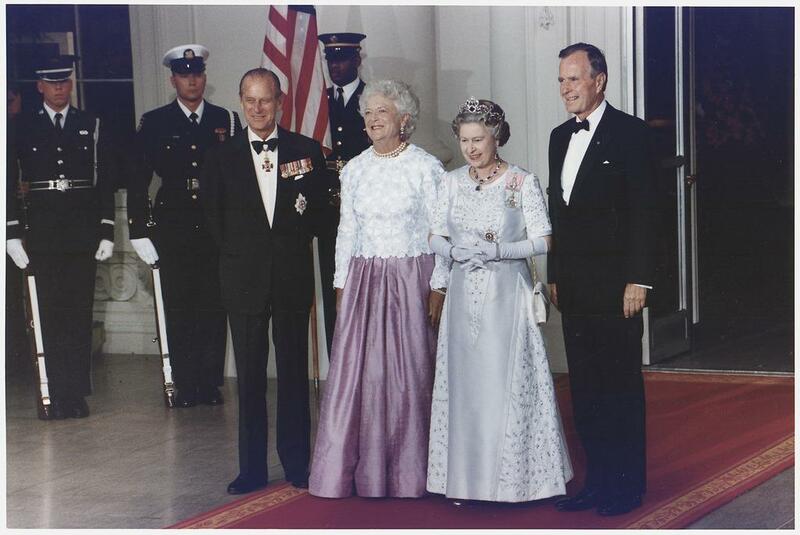 Since it was a black tie dinner, she wore only the Star of the Order of the Garter and her Royal Family Orders. I know many are not fans of that sapphire tiara, but I find that I'm so happy to see a colored stone at a state banquet that I can't be bothered one bit. Did you spot it? Queen Victoria's Wheat-Ear Brooch in her hair! She's done that on a few occasions, but not frequently, and it's always fun to see her add a little hair sparkle even when forgoing her tiara. Arriving in Texas in Queen Victoria's Bow Brooch. 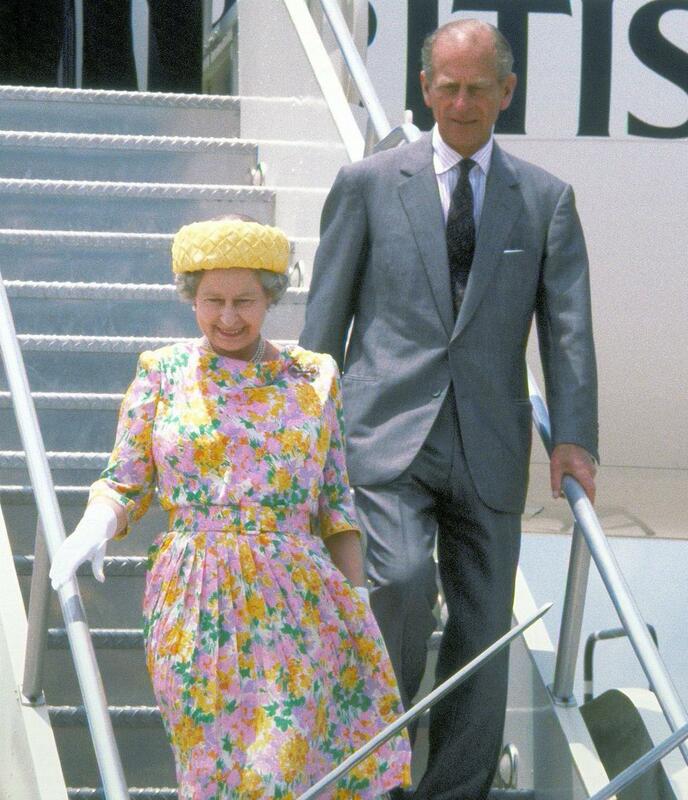 In addition to the required stop in Washington, D.C., this trip took her to Baltimore, Miami, Texas, and St. Louis, and it was captured on video for the 1992 documentary Elizabeth R. The excerpt below (a fun watch that includes her reaction to the Talking Hat incident, which made me laugh) features another evening appearance, wearing the King Khalid Diamond Necklace and the Antique Girandole Earrings.